It’s Time To Kick Off Maureen Simon’s Virtual Book Tour! 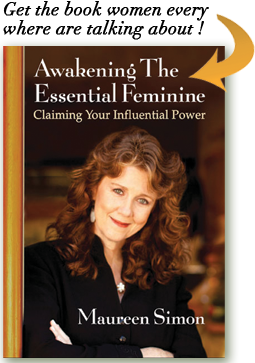 On November 28th, 2011 we are launching Maureen Simon’s virtual book tour for her book, Awakening The Essential Feminine Claiming Your Influential Power. Virtual Book Tour Dates: November 28th-December 7th 2011. A VBT is an online “event” where an author “visits” a different blog each day during a specified period of time. Maureen’s book tour is 10 days in duration. Each day we encourage you to visit each host on the tour and receive a different gift. Maureen has put together three beautiful videos for you, interviews, a podcast, heartfelt answers about intuition, and shared several excerpts from her book. Join us Monday November 28th as we launch Maureen’s virtual book tour with a live radio show! Full virtual book tour details are listed below. Stop by each day and enjoy several juicy gifts from Maureen. Hint: Some virtual book tour hosts will be giving away copies of Awakening The Essential Feminine Claiming Your Influential Power ~ For women who know that their feminine gifts are needed now and for women who want to know more. To find out which hosts are hosting a giveaway be sure to follow along the tour each day. Day 1: Monday November 28th, 2011~ Radio Host: Linda Rivero Kicks of VBT with a live radio show. Linda is the host of Global Feminine Rising Radio Celebrating the Rise of Feminine Energy on our Planet. Did you miss the kick off on live radio? No problem, here’s the replay link. Nancy is a woman with passion and a vision of inspiring and empowering others to be better people for themselves and in turn for the world! She encourages others to grow in their daily lives; to be open to change. She is here to listen to your thoughts and in turn be your collective voice. Visit Red’s website ~ The Redhead Riter to see the three heartfelt answers Maureen answers about intuition. Especially this question. How do we teach others or our daughters to trust and use their intuition? Find out Maureen’s answer and read an excerpt from her book on intuition. Sherry has an amazing Blogfrog community full of outspoken women, you are going to want to visit and connect with. Visit Leigh’s website ~ A Leigh Edwards for a delightful excerpt from Maureen’s book about relationships and inter-connectedness. As a Law of Attraction Practitioner, Leigh helps conscious, heart-centered women build and strengthen their relationship with themselves as a foundation to uncover their “blocks” and LEAP fearlessly into living the life of their dreams…Body/Mind/Spirit. She has openly been sharing her thoughts on a recent loss in her life. Stop on by and visit Carol and Stacy’s blog ~ Intentional Conscious Parenting. They have a very special interview with Maureen to share with you. Carol and Stacy write about conscious parenting topics, book reviews, author interviews and host live author chats. Carol and Stacy are following a passion of writing children’s picture books that teach children about intuition, their angels, their physical & energy bodies and much more. They are here to support the inner light of the children and connect parents and authors of like-minded thought. Karyn is the designer and creator of “A Glorious You” Visionary, Creator of the Pocket Coach, NLP Trainer & LOVER of human excellence! Entrepreneur, Director of Forward Focus Ltd, All By Design & 4sisters. Co-Developer of The HOW: Develop Your Inner Coach DVD, Co-Arthur of Questions: You are the Answer You Seek. Host of Change – Masters In Action on Motivational Radio with over 2 million weekly listeners. Continuing along on the virtual book tour, Maureen will be making a virtual stop in New Zealand! Visit Karyn’s website 4 Sisters Connect. Stop by for a special video about transformation created in Maureen’s lovely herb and flower garden just for you! Angela Artemis is a freelance writer, intuitive coach, clairvoyant and medium from the New York area. She is also a financial salesperson with a 25 year background in financial planning, private banking and real estate finance. Her ability to navigate a demanding finance career while developing spiritually and psychically have given her a reputation as a very grounded and practical intuitive reader and medium. On day 7 Maureen stops by virtually to Angela Artemis’s website ~ Powered By Intuition. Join Angela and Maureen for a very special podcast about intuition, including the answer to this question. Do you think the message of the Essential Feminine will change the way corporations are structured? Kasey is a leader of creative writing workshops, Kasey has inspired hundreds of school-aged children to write and capture their thoughts and feelings on paper. She had the privilege of leading adult writers in her workshops, The Write to Heal. Kasey is currently training as a Reiki volunteer in a Neonatal Intensive Care Unit and working toward becoming a Reiki Master. Like many of us, her bedside table and bookshelves are overflowing with her beloved books. Be sure to stop by and visit Kasey on day 8 of Maureen’s virtual tour for a special video about “conscious choices.” Are you fully showing up for yourself each day? The second to the last day of the tour makes another fun stop at The Organic Blonde. Be sure to visit Jacqueline Rizk ~ The Organic Blonde to read an excerpt from Maureen’s book about communication. After several years of battling inexplicable fatigue, hormonal disturbances, skin allergies and other health issues that were just not normal in someone her age, Jacqueline decided she was sick and tired of feeling sick and tired all the time. She became passionate about what went into her body, and what she used on her skin and in her home, even what she fed her darling pets. She wanted to take her passion to the streets. The Organic Blonde is that passion! Our final and last day of the tour wraps up at Leigh Harris’s website Metaphysical Mom (and Dad). Stop by and say hello to Leigh and take a look at the excerpt from Maureen’s book about harmony & peacemaking. Leigh Harris has one overarching passion: to empower others to make permanent changes in their own lives. Leigh has positively affected over 7500 adults and children in her work. Her clients and graduates have made permanent changes in their lives with improved confidence in their actions, increased self-esteem and quality of life, and released blocks to attain new levels of personal trust and success. Thank you everyone for following along Maureen Simon’s virtual book tour. A big shout out to all the virtual book tour hosts! You were all hand-picked for the values and content you deliver to your audience. From our heart to yours, Thank you to all of you for being a part of such a fun and vital event. We look forward to hearing your feedback, reading your comments and mailing off copies to all the winners! If you missed the special invitation for December’s Live Living Room, you can see all the details here.